Backless, swivel bar stool with solid hardwood or upholstered seat. Great anywhere. Durable Solid-Steel frame with choice of metal finish. Non-Marring foot glides. 15" Diameter Seat Size (14" on wood version). Available in 2 heights. Grace Mfg. 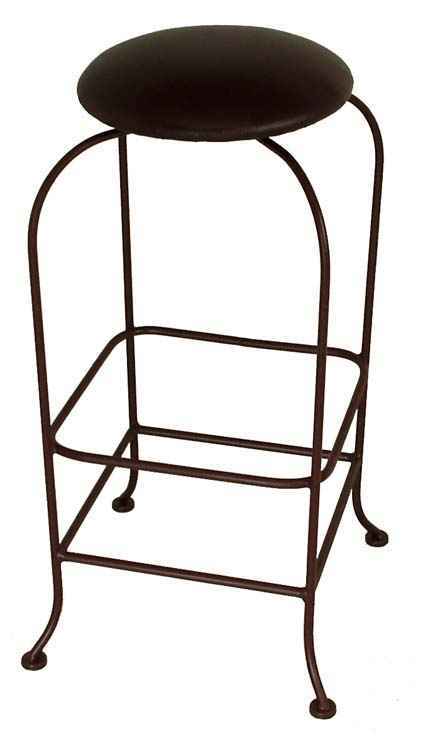 Co. Inc. is metal and wrought iron furniture manufacturing company selling at wholesale. We are located in the the NW corner of Ga. in the town of Rome. Our accessories division , The Grace Collection, imports and distributes unique home accents and accessories for the home. We manufacture barstools, bakers racks, wrought iron beds, dining chairs, dinettes sets and tables and store display fixtures. We have a comprehensive line of gift store fixtures for retail store display. Our line also includes kitchen counters stools, hanging pot racks for the kitchen and bistro sets in a variety of styles from whimsical to neoclassic and traditional. Our pot racks are a favorite with gourmet stores. The company has been in Business for Over 30 Years and we employ skilled artisans and craftsmen. Aside from having some state of the art manufacturing equipment we still assemble and finish our product by hand. Many of our items are hand made or hand painted and very unique. We have gained a reputation for implementing unique ideas to traditional products. You will not find a better resource for attractive store fixtures and display fixtures with glass shelves for gift and specialty stores. The cast dining base line is very nice with thick glass table tops. You will also find that we are an excellent resource for glass.